In addition to street parking, CityCenter offers valet parking located on H Street with a 33% discount up to three hours. Valet parking begins at 6:30PM. Self-parking is located on 9th Street between H and I Street, with a 33% discount up to two hours. Please ask our Maitre 'D about information regarding parking validation. DBGB is conveniently located to all Metro lines. Use the Gallery Place Station for Red, Green, and Yellow lines and Metro Center Station for Red, Blue, Grey, and Orange lines. 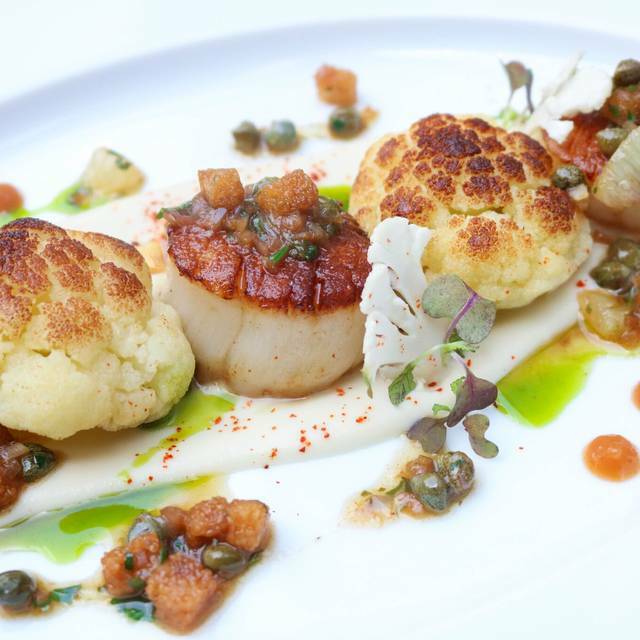 DBGB is Chef Daniel Boulud's casual restaurant specializing in seasonal Lyonnais-inspired bistro cuisine. 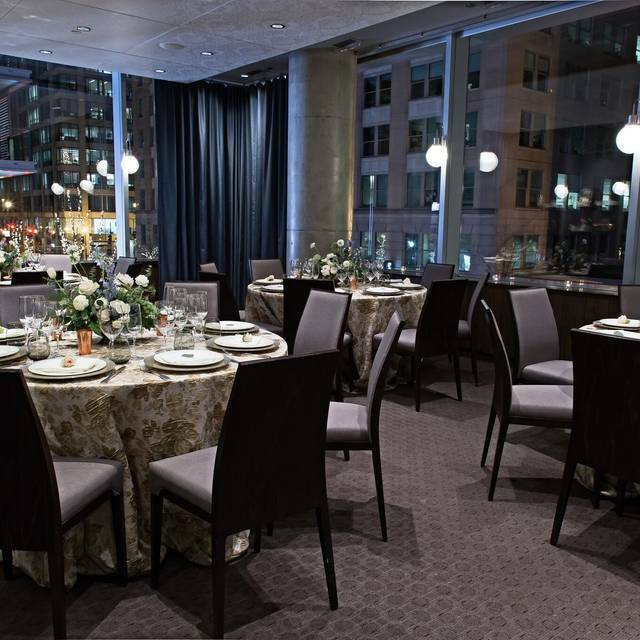 Located at CityCenter in the Penn Quarter, DBGB is a short walk to the Convention Center, Verizon Center, and The White House. 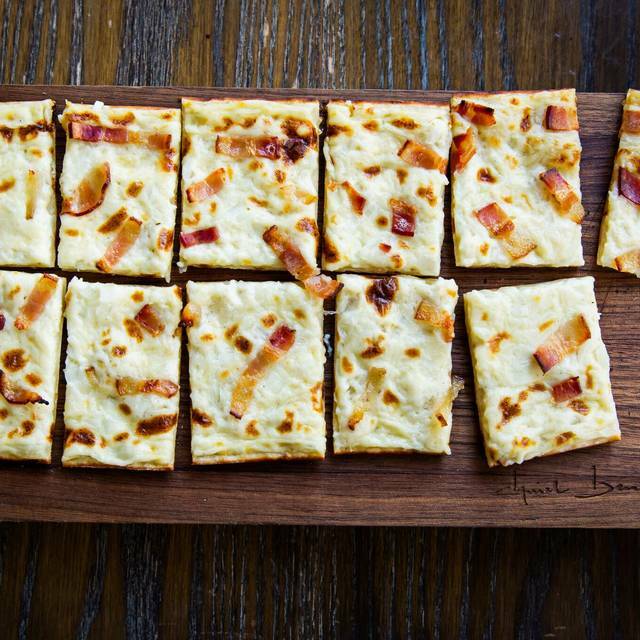 We serve dinner seven nights a week, lunch Monday to Friday, and brunch on the weekends in a casual yet comfortable setting. Bar and lounge seating is always available and walk-ins are encouraged. Two spacious private rooms accommodating from 12-50 people are located on our second floor. 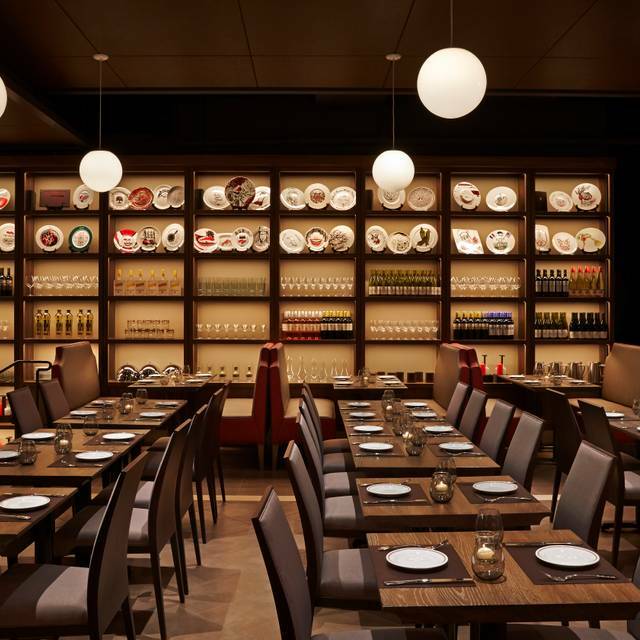 We also host smaller groups with personalized prix-fixe menus in our main dining room. We look forward to serving you! We will be offering an a la carte menu for both brunch and dinner along with festive specials created by Chef Nicholas Tang and Chef Daniel Boulud. Food is always good here. The somm was great. Service was extremely slow. Came here on a Saturday night for a nice dinner. We got seated in a corner booth. It was a nice mix of romantic and casual. The tuna appetizer was delicious and the blue crab spaghettini was perfectly seasoned. I would recommend a half order of the spaghettini even as an entree since it is so large -- I really appreciated the waiter for suggesting a half order was available. We also ordered wine by the glass and the waiter enthusiastically brought different wines by the glass to sample before we ordered. Excellent food, excellent service, excellent location. Once we got past the pompous front desk everything was fine. We arrived 45 minutes early for our reservation and were told they could not seat us now but our table would be available at 7:30. We went to the bar for a drink. Off the side of the bar were several empty tables. Wouldn’t you know, that at 7:30, when we were being seated in one of those empty tables. We took the table and the remaining tables stayed open the entire time we were there. Was it just a control thing?? Thank goodness for the delightful waitress. Her personality took the bite out of the front desk attitude. And the rest of the evening was good. The branzino for two was tasty but just a bit dry. Stephen Miller was eating next to our table. It was very uncomfortable to eat or relax. Won’t be revisiting. Normally, DBGB has been quite good to me. This trip, the service was awful, likely because they were severely understaffed. It took too long to get our first drinks. 10 minutes after half the table finished one appetizer and everyone finished a first round, it took another ten minutes before we found a waiter to cancel the unserved appetizer and order wine. For the prices they charge, the service was abysmal. Just have lunch at the bar! a terrific lunch menu with the best frieze salad I've had. Terrific Somme and a very good wine by the glass program. Also check out the 3 course lunch. 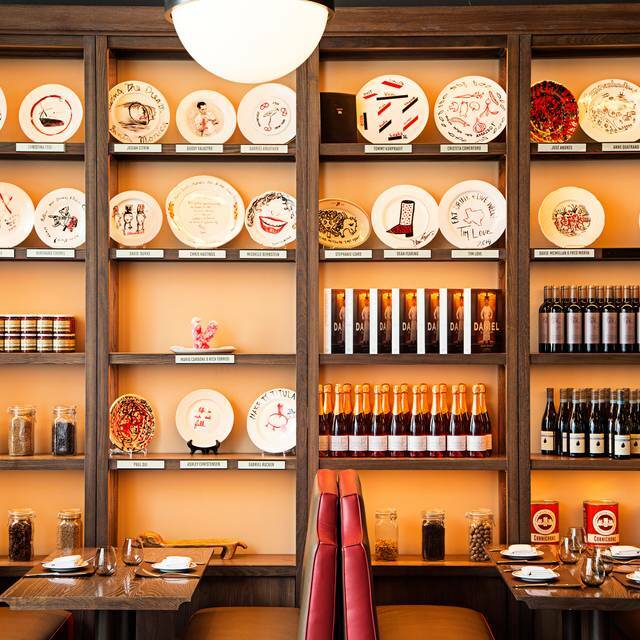 This chic-looking restaurant carries the famous Daniel Bouloud name. But it was not a memorable experience for use. We arrived at 6:05 PM on a Sunday, 10 minutes before our 6:15 PM reservation. We shared a crab cake appetizer, which was good--but not as good as some of the broiled crab cakes we've had in other restaurants-- and the DBGB crab cake was definitely over-priced. My husband had a duck entree, which was very good. I ordered the halibut, which they had already run out of by 6:15 PM, so they substituted rock fish. It seems odd to run out of a main dish so early in the evening. Although our server was prompt and very nice, we did not receive our entree until 7:05 PM, one hour after we arrived. The restaurant was less than half full, so I don't know why it took so long to arrive. I asked the server if the entrees came with enough vegetables to be satisfied, and she said they did. However, my rock fish had very few vegetables. We then ordered a side of cauliflower, which was served promptly. The cauliflower was very tasty, but swimming in oil. The wine was excellent and service superb. Cowboy ribeye was good not great. Loved pommes puree, veggies delicious. Very busy on a Saturday and perhaps service could’ve been more efficient. The food was good, but the service left a lot to be desired. Our server seemed unable to give us suggestions when we asked about appetizers to share among four people, and two different managers came by separately to first invite my friend to open her unopened lemonade bottle that she had bought earlier and was moving to her bag and then to scold her for opening it and pouring it into a glass the first manager had brought her for it. Mixed messages and not very helpful, overall! One of the best restaurants in DC. Great menu and great staff. Nice pace of service. This is our go to place emergency we’re in DC. 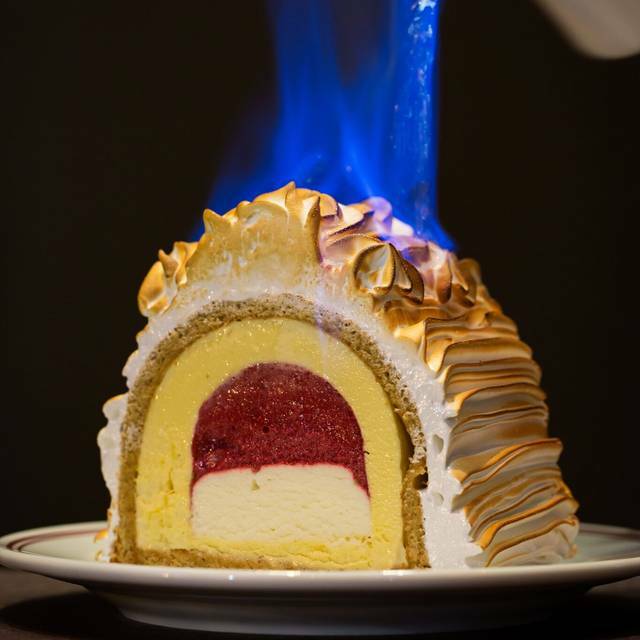 The Baked Alaska is a must! So different and tasty! Everything else was wonderful. An overall great experience! Got lucky to have Chef Boulud in the restaurant that night. He was so nice and came by the table to thank me for dining with them. He even autographed the menu for me and told a picture. Great experience. The food was so tasteful and original! Perfect combination of foods. Waiters were kind and professional. Chef Boulud and Chef Tang spent the time to talk to us. Loved it! Bartender Mike (if I recall his name correctly) knows how to make drinks! 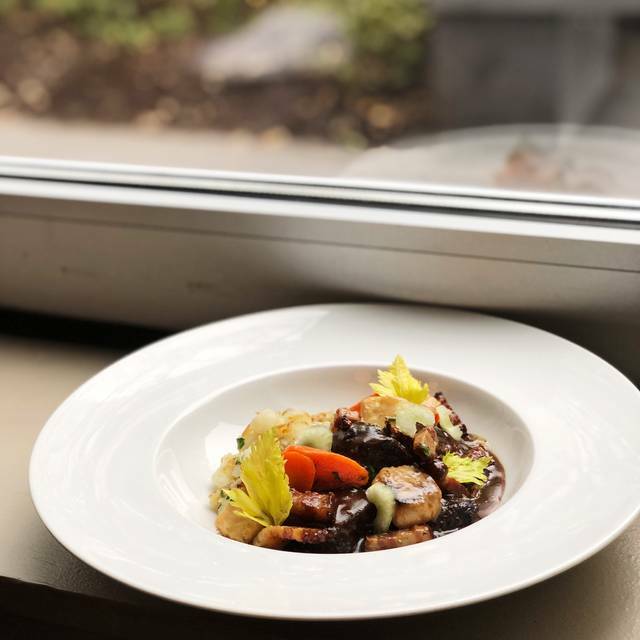 We have eaten at several Of Daniel Boulod's' New York restaurants and this one continues the excellence that we have encountered in New York. The menu was a special one with wine pairings for the occasion of the Cherry Blossom Festival. Over the span of over 3 hours, we savored every aspect of our visit. The food, from canapes through cold pea soup to the end showed a springlike progression, and the wines selected were an appropriate match. We went to enjoy a special menu for the Cheery Blossom Festival. 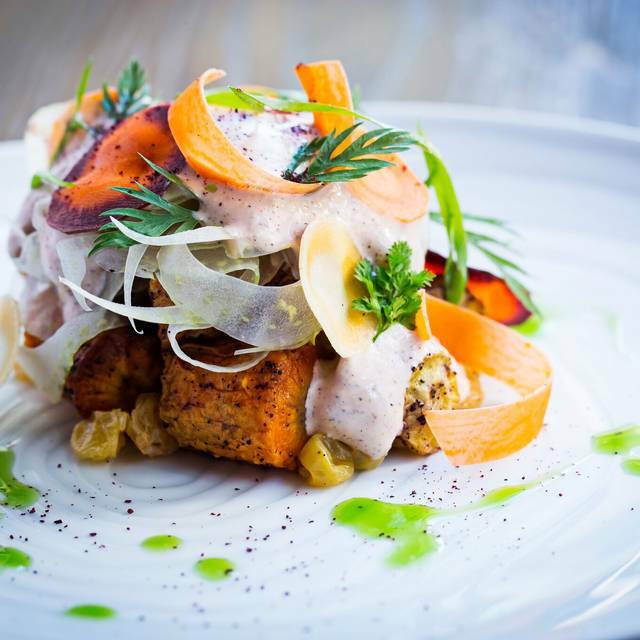 Chef/Owner Daniel Boulud replicated the menu he had for the opening of his first restaurant in NYC, Daniel. It was beautiful, and so delicious! The wine pairings were perfect! The staff was so courteous and helpful! It didn't hurt that we met and had our picture taken with Chef Boulud!! It was an excellent way to spend a Friday date night! Very good service , entree were good as well although for “ express “ took ~ 30 minutes . We were there to celebrate my daughter’s birthday at brunch, and it was clear that they had really gone all out to make sure it was a fantastic experience for us. The food was wonderful. The service was outstanding. And most of all, they made it a joyous and delicious event. So glad they recommended the beignets with Nutella...can’t wait to have them again! with tomato, chile, basil, toasted bread crumbs. it just tasted like underseasoned spaghetti sauce and there was a minute amount of crab that was so shredded you would be hard pressed to know there was any- this was $35. The waiter & manager saw my displeasure and promptly brought me the scallops- much better (and thank you). Although at the beginning we said we needed separate checks (common in DC for business meals), we had to ask for our checks 3 times and only one check came out. Essentially by this point we just wanted to leave. 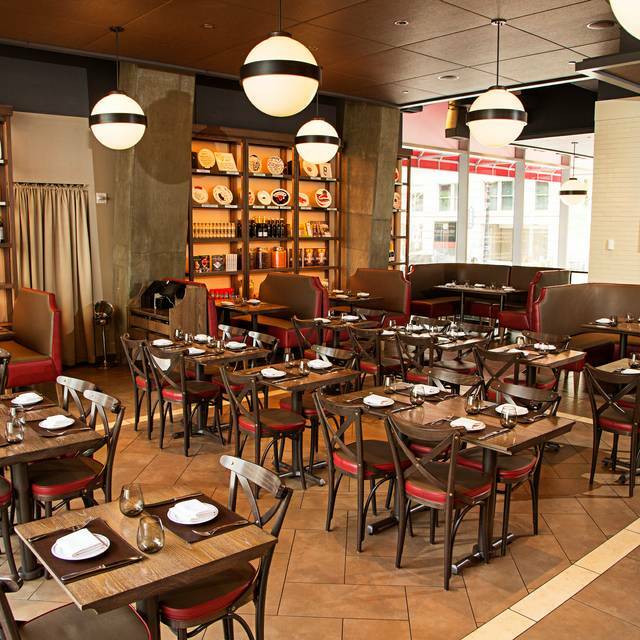 Every Daniel restaurant is excellent in its lane and DBGB is no different. It is one of my go to choices in NY and DC. We were celebrating my husband’s birthday (which I noted when making the reservation). The restaurant staff did a great job of acknowledging his birthday, and the chef also sent out a complimentary birthday dessert. The food and service were outstanding, and made for a memorable evening. The food, ambiance, and service were all outstanding -- exceeded only by the souffles on the dessert menu, of which, over two days, I consumed three! The service was terrible. We did not have a dedicated server for our table and had to continually look around to try to find someone willing to acknowledge us. We watched another table that was seated at the same time as us get their meals before we had even ordered. Our sparkling wine was being chilled at the servers station, but nobody ever came around to refresh our glasses. Eventually we had to take our bottle out of the ice and leave it at the table. I'd overlook terrible service for amazing food, but the food was bland and nothing special. We were celebrating our wedding anniversary and the staffs was awesome and service was impeccable and attentive. The food was top notch however the portions was on the small size and we particularly did not like the pomme tartin ! The ambiance is quite nice and the service - from the serving staff - was attentive but casual, which is my preference. Food was all around tasty; extra effort was put in at the bar to accommodate a ‘special’ request of mine (How a sugared rim on a Sidecar is out of the originate is beyond me, but in the end the rim was sugared and I was happy.) Profiteroles for dessert were quite good. Only complaint was that upon arrival, with a reservation, they wouldn’t seat me until the other person arrived. On a Wednesday night with visibly open tables that is just annoying. When the other party arrived in the 5 mins we were left standing at the host stand as the host came back to their post - TWICE - without seating us. But that is a detail. Overall a very nice evening. Food was excellent. Server knew her wines and made great recommendations about what would go with what we ordered. Overall great experience. This was one of the best dining experiences I've had in DC in a long time. You wouldn't think that a charcuterie board could be exciting, but this was special. The absolute start was the slow roasted branzino for two. We were four people and ordered two of them. Everyone was in heaven! I may have to go back soon just to have that dish again. The fish was cooked perfectly, great silky texture, great flavor, in an incredible (but light) lobster sauce with crab and scallops and a couple mussels and clams. Oh, and roasted potatoes and carrots. Just divine. The only thing that I find frustrating about DBGB is that they charge $45 for corkage. We bring a bottle just about everywhere we go because we have a lot of wine at home and enjoy drinking it with a good meal. Who doesn't? This is the highest corkage fee we've seen in the DC area, except for maybe Marcel's and The Inn at Little Washington, and even the Inn waives corkage if you also purchase a wine from them. We'll be back at DBGB often, but it stings to pay $45 to open our bottle. The kids menu items were fantastic. My kids really enjoyed their meals. My wife and I enjoyed the branzino for two. Simple but so good. Just a little salty though. I can’t believe how slow the service was on a Thu night, especially since the restaurant wasn’t full. The waiter seemed busier than he needed to be and I felt like our table was an afterthought. Perhaps it’s because a gratuity was already included in the bill. We had to hunt him down twice the only time he was super responsive was when it was timto pay him, but by then someone in my party had complained to management. They ran out of a desert we had selected so the manager was kind enough to comp our desserts plus because of the long waits we endured. The food was decent but it’s not worth the inattentive and slow service. I love the restaurant but this one night we came with important friends to introduce them to your restaurant, the service was terrible: slow and unfriendly. Waitresses need to smile. We held an amazing dinner for 30 guests in November and it was spectacular. This time, it didn’t meet even the standard bar for service. Had the chicken-it was awesome. Service was en point! They took very good care of our party of 10. Servers were very attentive and the food was perfect! I was surprised by how lovely and intimate a space it was. I loved the room, decor, and the fact that you can look out at city center. The waitstaff was wonderful to us with our 1 year old, and were super helpful. The food was just fantastic and it was one of the best Bloody Marys I've had! I would definitely go back and would recommend it. We went for brunch and this was a refreshingly quiet and relaxed space for a nice meal.